Human ITGAIIb & ITGB3 Heterodimer Protein (IT3-H52W8) is expressed from human 293 cells (HEK293). It contains AA Leu 32 - Arg 993 (ITGAIIb) & Gly 27 - Asp 718 (ITGB3) (Accession # P08514-1 (R887L) (ITGAIIb) & P05106-1 (ITGB3)). Human ITGAIIb & ITGB3 Heterodimer Protein, produced by co-expression of ITGAIIb and ITGB3, has a calculated MW of 111.4 kDa (ITGAIIb) & 81.8 kDa (ITGB3). Subunit ITGAIIb is fused with an acidic tail at the C-terminus and followed by a polyhistidine tag and subunit ITGB3 contains no tag but a basic tail at the C-terminus. The reducing (R) protein migrates as 125 kDa and 145 kDa (ITGAIIb) and 110-120 kDa (ITGB3) respectively due to glycosylation. 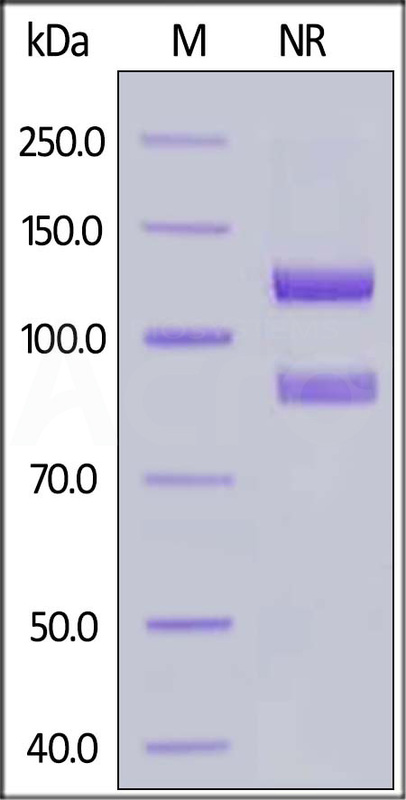 Human ITGAIIb & ITGB3 Heterodimer Protein on SDS-PAGE under reducing (R) condition. The gel was stained overnight with Coomassie Blue. The purity of the protein is greater than 90%. 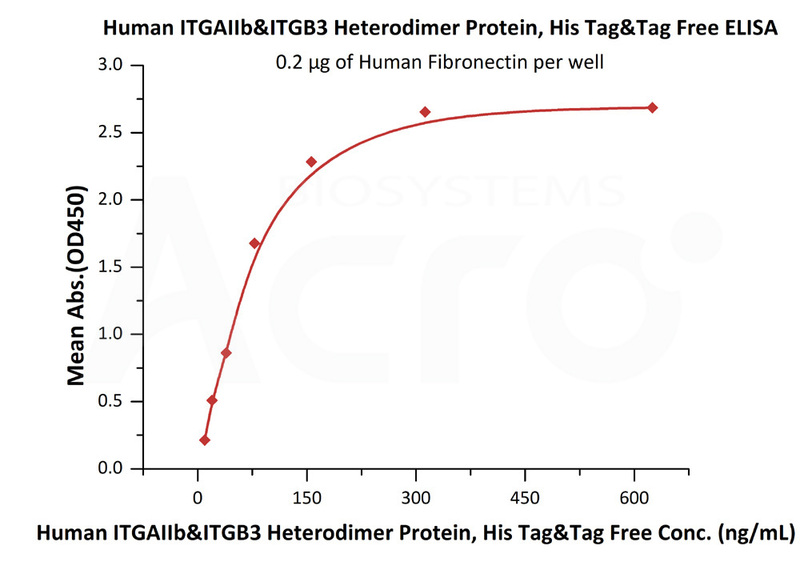 Immobilized Human Fibronectin at 2 μg/mL (100 μL/well) can bind Human ITGAIIb & ITGB3 Heterodimer Protein (Cat. No. IT3-H52W8) with a linear range of 2-78 ng/mL (QC tested). Immobilized Human ITGAIIb & ITGB3 Heterodimer Protein (Cat. No. 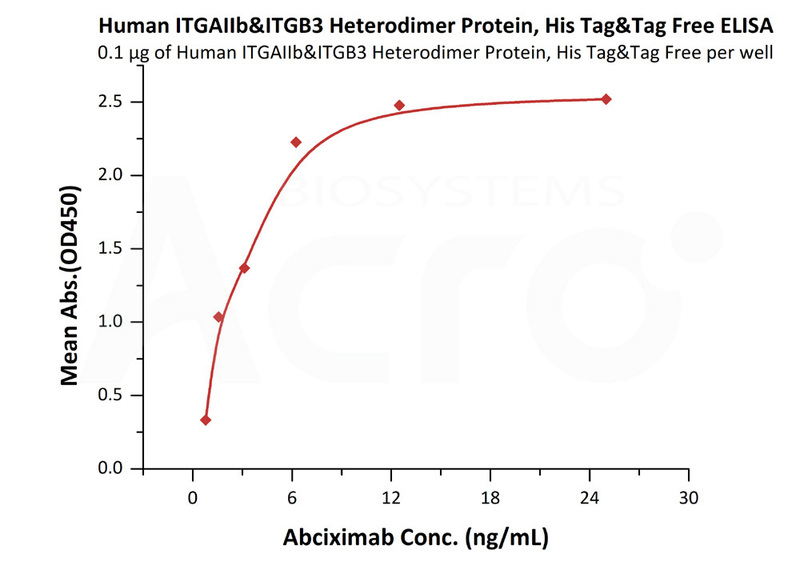 IT3-H52W8) at 1 μg/mL (100 μL/well) can bind Abciximab with a linear range of 0.8-6 ng/mL (Routinely tested). Integrin alpha IIb beta 3 exist in a conformational equilibrium clustered around four main states. These conformations range from a compact bent nodule to two partially extended intermediate conformers and finally to a fully upright state. Activation of blood platelets by physiological stimuli at sites of vascular injury induces inside-out signaling, resulting in a conformational change of the prototype Integrin alpha IIb beta 3 from an inactive to an active state competent to bind soluble fibrinogen. Furthermore, ligand occupancy of Integrin alpha IIb beta 3 outside-in signaling and additional conformational changes of the receptor, leading to the exposure of extracellular neoepitopes termed ligand-induced binding sites (LIBS), which are recognized by anti-LIBS monoclonal antibodies. (2) Basani RB., et al., 1996, Blood. 88:167-173.